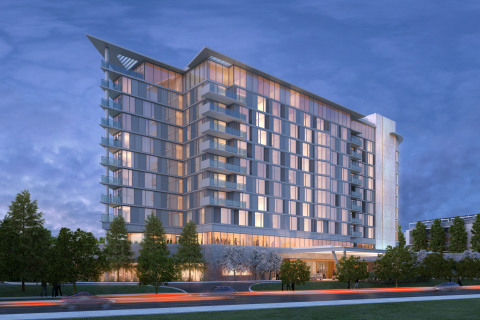 MENLO PARK, Calif.--(BUSINESS WIRE)--Ensemble Real Estate Investments and AECOM Capital today broke ground for a 250-room luxury lifestyle hotel, the first in decades to be built in Silicon Valley from the ground up. The 11-story hotel, which will be a member of Marriott’s Autograph Collection®, is a key component of Silicon Valley’s landmark Menlo Gateway project, which will transform 16 acres of industrial land east of Highway 101 in Menlo Park into a vibrant work and leisure environment. Menlo Gateway will be developed by the Bohannon Development Company. In addition to the hotel, it will include three office buildings and accompanying parking structures, a Bay Club fitness facility, and outdoor amenities. Menlo Gateway is the new gateway to Silicon Valley. The mixed-use project is spearheaded by Bohannon Development Company and re-uses industrial land east of Highway 101 in Menlo Park, Calif. Menlo Gateway is designed to meet the needs of today's businesses and knowledge workers while benefiting the residents of Menlo Park. Built from the ground up to meet LEED certification requirements, the project provides sustainable office space, an Autograph Collection hotel, a Bay Club fitness center, parking structures, open space, and easy access to Bayfront Park. AECOM Capital, a subsidiary of AECOM, is an investor and developer of real estate, infrastructure and renewable energy projects. With a focus on real estate developments and public-private partnerships, AECOM Capital targets high quality risk adjusted investments across North America and select international markets. AECOM has vast resources across all engineering, design and construction services that AECOM Capital leverages for deal flow, due diligence, execution and project delivery. Since its formation in 2013, AECOM Capital has invested in 14 projects, with a total development value in excess of $3.5 billion and 7 million square feet. Learn more at aecomcapital.com. Ensemble Real Estate Investments is a privately held commercial real estate investment, development, and management firm. The group has a long history of maximizing investment returns by developing, renovating, and repositioning hotel assets while adding value to the respective communities. Ensemble specializes in assembling customized teams to realize its vision for each specific market. With its combined operational expertise, development acumen, and asset management capabilities, Ensemble has fostered strategic and fruitful partnerships with boutique hotel operators as well as with global brands, including Hilton, Marriott, and Hyatt. For more information, go to www.ensemble.net. The new Marriott Autograph Collection luxury lifestyle hotel in the Menlo Gateway project will be the first in decades to be built in Silicon Valley from the ground up.